Google seems to be testing yet another format for the local pack ads. @SilverbackStrat shared a screen shot with me showing a local ad pack which looks like the AMP carousel. A horizontal scrollable set of cards that you can scroll or flick to get more results. In this case, it shows a map, followed by a normal snippet, then the location and then the phone number. 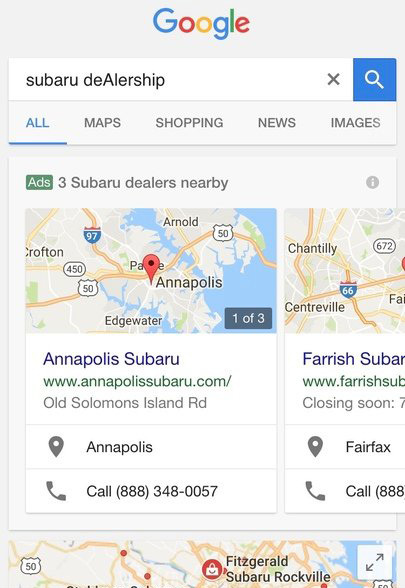 This came up for Subaru dealers on mobile, which showed "3 Subaru dealers nearby." I think this ad layout is cool but from what I hear, the horizontal scroll feature is something many users simply do not understand how to use. Although, maybe that behavior is changing?